Hope's Cafe: Trim Treads Review and Giveaway! It seems that toning footwear is the new biggie in fitness products. I was recently given the opportunity to review a pair of Trim Tread sandals, and I must say I really like them! According to the Trim Treads website, wearing these shoes for just 30 minutes a day will give you toned legs, stronger core, better circulation, perfect posture, improved balance, and help burn calories! I enjoy wearing these around the house while doing cleaning and just normal everyday things. I have even used these while cooking in the kitchen, which made for an interesting time! 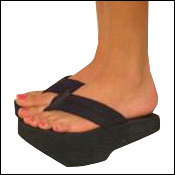 At first I had a hard time getting my balance, but quickly adjusted to walking in the sandals. I even tried some of the heel and toe lifts, and some squats with the Trim Treads. I could really tell a difference in the extra effort it took to balance on the sandals! While they obviously don't take the place of an aerobic workout (don't you wish!) they are a great way to get some extra calorie-burning into your day! And, on those days when I get too busy, and just don't have time for a 30 minute workout, I enjoy knowing that with the Trim Treads, I have at least done more than I would normally accomplish. It is so easy to slip into the sandals for just a half hour (or more!) every day and get some extra benefits just from walking around the house! "When you wear Trim Treads, the motion when walking is similar to that of balancing in combination with using a Stairmaster; while staying balanced in these shoes, you can concentrate on different muscles that are not normally used when wearing every day fitness shoes. Trim Treads are an affordable way to work out and are cut so dramatically so that your body gets more activity in less time. The shoes provide people with an effortless and inexpensive way to trim their bodies when they don't have the time or money to devote to the gym. The deep vein pumping action that occurs with every step taken can significantly reduce the onset of varicose and spider veins. Wearing the shoes can also diminish existing cellulite and prevent it from developing, and can help ease lower back pain, swelling in the arms and legs, and the discomfort of plantar fasciitis. The steps are simple; if you wear the shoes for 30 minutes a day while standing and going about everyday activities you can lift your buns, tone your legs and strengthen your core. The shoes work by encouraging balance on the flat part of the shoe under the ball of your foot, which engages the muscles in your legs, buttocks and core. Trim Treads shape your body and burn more calories than ordinary workout shoes. Trim Treads offer more benefits in less time and at a much more affordable price." Trim Treads is giving a pair of Trim Tread Sandals to the winner of this giveaway!! 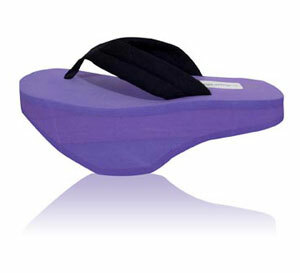 Go to Trim Treads and tell me your favorite color of sandal! Disclaimer:I was not monetarily compensated in any way for this post. All thoughts and opinions are mine. All quotes taken from the Trim Treads website. I really like the Lavendar Sandal. I like the grass color.